Jinnah Post Graduate Medical center, Karachi, Pakistan. Associate Professor Orhopaedics, Jinnah Post Graduate Medical center, Karachi, Pakistan. Objective: To assess the preparedness of the hospital emergency system and medical personnel’s in dealing trauma victims of terrorist bomb blasts in Accident and Emergency. Patients and Methods: Four major terrorist bomb blasts incidents occurred in Karachi from December 2012 to May 2014. All patients of these 4 incidents were brought to Accident and emergency of Jinnah Postgraduate Medical Center. Place and type of bomb blast, their initial search and rescue, transfer and transportation noted. Data collected of these patients at Accident and emergency of Jinnah Post Graduate Medical Center, regarding triage, primary and secondary survey with adjuncts performed. Data was also collected from emergency operation theatres, Intensive care unit and admissions in wards. Time taken for early and effective management and disposal to different departments noted. Results: Total victims of these four bomb blast incidents were 179. Nineteen were brought dead, 8 more died within two hours, due to multiple system involvement which made total deaths 27 (15%). 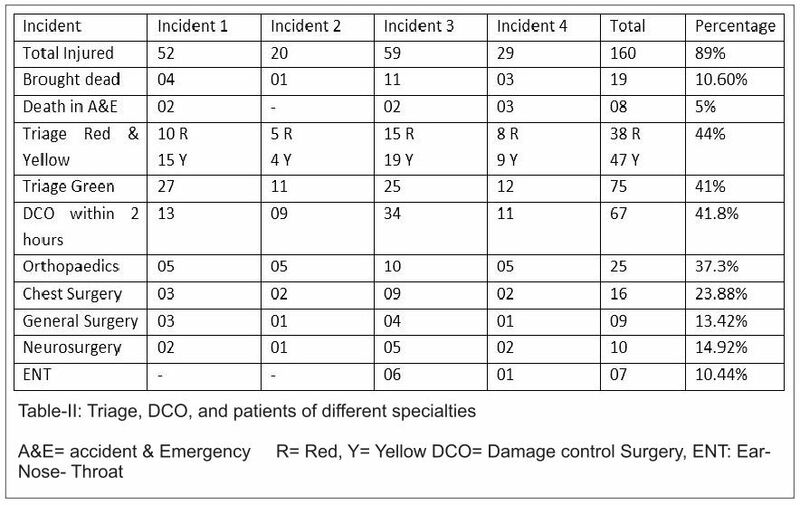 The patients were triaged with color coding, 44% of these patients were red and yellow, and 41% patients were of minor injuries and were labeled green. Total 67 (41.8%) underwent damage control surgery within two hours of arrival at accident and emergency. Most of the admissions were of Orthopedics and Chest surgery. Conclusion: Effective and early disposal of patients from Accident and Emergency needs collaborative efforts of hospital administration following comprehensive disaster plan & preparedness. Trained triage team with quick surgical response needs trauma training, disaster management courses and drill exercises for doctors and health workers. Keywords: Terrorist bombing, Preparedness, Triage, mass casualties, management. Pakistan is the most affected country by terrorism in the world after Iraq & Afghanistan, where severity of terrorist incidents is considerably more than these two countries. In the year 2012 alone, Pakistan suffered from 1404 terrorist attacks, surpassing Iraq (1271) and Afghanistan (1023). On analyses from the year 2001 to 2013, there were 13,721 incidents in Pakistan. The number of suicide bombing between 2001 to 2007 were 15 only, but from 2007 to end 2013, suicide attack jumped to 358 the highest anywhere in the world. Karachi is the largest and the most populated city of Pakistan which spreads over 3530 Sq. kilometers with disorganized slums and the presence of 1.5 million illegal immigrants. This all makes the Karachi one of the most attractive place for terrorist activities. Bombs are attractive to terrorists as they are relatively easy to design, assemble, and deliver by changing modalities, and because they are sudden and violent in nature. Large explosions attract media coverage and produce large numbers of casualties, and increases the sentiments and anger of general public resulting in violence & disruption. Security at the hospital’s Accident and Emergency entrance is very important for smooth functioning during disaster management. Media handling is important by providing information and facilitations at one place. For all these tasks prior training & drill of Accident & Emergency staff and the surgical team is very important which enhances collaboration and coordination during the disaster. [10, 11, 12] This study is performed to access the preparedness and effectiveness of the A&E department after series of training workshops and disaster drills carried out for the security personals, media managers, paramedics, medical staff and doctors. 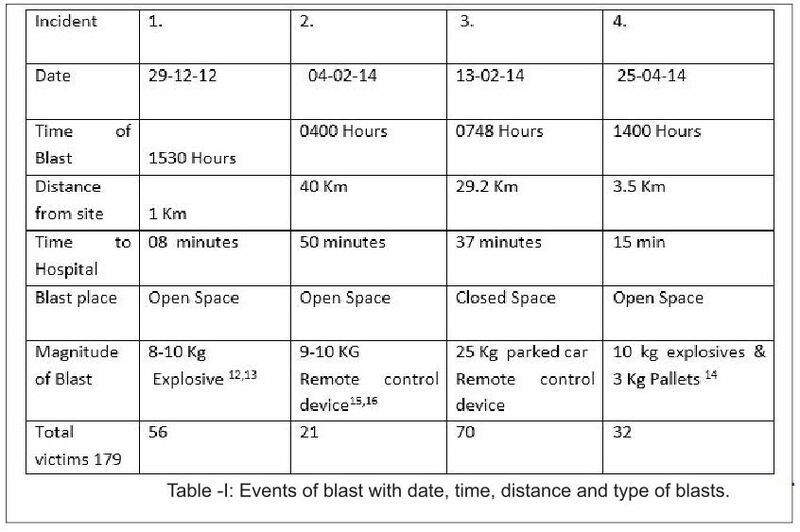 This is the study of four major events of bomb blast which occurred in last sixteen months in Karachi. All victims of these four bomb blast were transferred immediately from scene of blast to A&E by “scoop & run” in different vehicles mainly ambulances without any treatment on the way to hospital. Incident 2: A bomb blast at Ghaghar railway track on 4th February 2014 at 0400 hours resulted in 20 casualties. Distance from site to JPMC is 40 km (24.85 Miles). Casualties started coming to A&E after 50 minutes. (Table I) All the staff from security personal to surgeons & anesthetist were prepared. In next ten minutes all patients were triaged, primary survey was performed and patients were immediately shifted to designated areas. Incident 3: Seventy Special Security Unit (SSU) personnel of police going for duty in a bus were struck with an Improvised Explosive Device (IED) implanted in a roadside vehicle on 13th February 2014 at 0748 hours near Police Training Centre. The distance from police training centre to JPMC is 29.2 km (18.02 Miles) and travel time is approximately 37 minutes. The first wave of casualties began to arrive in A&E in ambulances (Table 1). All specialties staff & consultants were available in A&E when first patient reached hospital. Incident 4: Delhi Colony Bazaar blast took place on 25th April 2014 at 1400 hours. The distance of the blast site from JPMC is 3.5 Km (2.17 Miles). The first casualties started reaching after 10 minutes. 29 injured and 3 dead victims were received at the A&E. (Table I). Hospital administration and A&E department got immediate blast incidents information through media. Emergency plan for bomb blast were activated immediately, information conveyed to surgical specialties and departments through hospital operator. Security came into action; they controlled the designated spots as per plan. Space was created in A&E by sending the existing patients to respective wards. As soon as triage was performed, patients were assessed with primary survey, all adjuncts were performed in resuscitation bay and secondary survey of every patient done as soon as patient got stable after primary survey. Urgent procedures performed immediately in A&E in few red tagged patients & others shifted to operation theatres. Yellow tagged patients requiring surgery were also shifted to operation theatre recovery room; other patients were admitted in wards for care. All dead bodies were kept at one place for medico legal proceedings away from working area. It was noted that most of the trained A&E staff was speaking the same language and managing patient according to trauma course protocol. All one hundred sixty patients presented with wounds of splinters, shrapnel or burns along with specific injuries to different body parts. Nearly all patients required wound debridement and wound dressings. Sixty seven patients underwent damage control surgery within next two hours. Orthopedic surgery was the busiest specialty, and common procedures performed were wound debridement, amputations, putting Steinman pin and application of external fixator in 37.33% of patients. (Table II) Next common involvement was of chest and sixteen patients required chest tube insertion for open & closed chest injuries. Nine patients required laparotomy. Eight patients died in A&E department within 2 hours of their arrival. They were having multi system involvement and having more than 70% burns in three patients. 75(41%) patients in green category were detained and managed with dressings of minor and medium size wounds. Secondary survey of all the patients was performed. It had been observed that around 15% of the victims of bomb blast died at site or within two hours, 44% of patients were in red & yellow category and 41% in green. All the patients who were labeled green were also kept under observation for at least six hours. Administration displayed & circulated computerized lists of all the victims of the blast and their place of admission. It was noted that after arrival of last patient of the incident, emergency was free of all the patients of bomb blast incident in thirty minutes time. During the four reported bomb blast incidents, a media staging area was designated, where regular updates were provided by the concerned officials. This media relation with hospital administration also improves patient’s management. It was observed that man power resources like OT staff, nurses, surgeons and anesthetist were always adequate as most live within hospital compound and everybody respond within 10-15 minutes. Primary survey, stabilization of patients and documentation started at the same time. 15% of patients of blast injuries were brought dead or died within two hours of their arrival during management; this corresponds to figure in most of the series. [9, 16]Those who required immediate surgery were shifted to operation theatres. All the other patients were dealt accordingly in Accident and Emergency Department, and within 30 minutes of arrival of last patient of the blast incident, these patients were shifted to respective departments according to the nature of their injuries. Immediate & early deaths in A&E, operation room and ICU were around 5%, which corresponds to other studies in similar circumstances. [15, 22]All data was recorded and analyzed. Complete list of the victims, their status and place of admission were displayed at a prominent place in hospital and briefed to media as well. Quick disposal of patients is very important from the Accident and Emergency Department as this can be a soft target for a secondary blast. [4, 22] Also, city wide riots can start in response to a bomb blast and new influx of patients start coming to the department. It is also noted that clinical manifestation of pulmonary barotraumas may take time to appear. In this series of incidents also 16 patients underwent Chest tube insertion due to detection of blast lungs. Minimally Injured patients (Green) also require a minimum of 6 hours observation before being discharged. All the measures taken in A&E department were for best management of patients of terrorist bomb blast; smooth functioning of hospital and utilization of resources effectively. Early and effective management at A&E needs collaboration of different agencies, pre event planning and preparation. A collaborative effort in a mass casualty incident can be achieved by repeated training courses and drill exercises for trauma, triage & disaster which results in reduced morbidity and mortality of the victims. Emergency medical technicians should be trained in on-site triage and following an Incident Command System. A centralized hospital communication can limit the burden of trauma on one particular A&E and the patients may be taken to other tertiary and trauma centers. The coordinated team achieves quick disposal of patients from A&E in 25-30 minutes and can save lives in the event of a second disaster. 1. Prommersberger KJ, Fernandez DL. Nonunion of distal radius fractures. Clin Orthop Relat Res. 2004 Feb;(419):51-6. 2. McKee MD, Waddell JP, Yoo D, Richards RR. Nonunion of distal radial fractures associated with distal ulnar shaft fractures: a report of four cases. J Orthop Trauma. 1997 Jan;11(1):49-53. 6. Watson-Jones R. Fractures and other bone and joint injuries. 2nd edition. Edinburgh: Livingstone; 1942. 8. Hamada G. Extra-articular graft for non-union in Colles’s fracture. J Bone Joint Surg 1944;26:833-835. 9. Bacorn RW, Kurtzke JF. Colles’ fracture: a study of two thousand cases from the New York State Workmen’s Compensation Board. J Bone Joint Surg 1953;35A:643-658. 10. Harper WM, Jones JM. Non-union of Colles’ fracture: report of two cases. J Hand Surg 1990;15B:121–3. 11. Saleh M, Ribbans WJ, Meffert RH. Bundle nailing in nonunion of the distal radius: case report. Handchir Mikrochir Plast Chir 1992;24:273-275. 13. Fernandez DL, Ring D, Jupiter JB. Surgical management of delayed union and nonunion of distal radius fractures. J Hand Surg 2001;26A:201–9. 14. Grecco Marco Aurélio Sertório, Angelini Luis Carlos, Oliveira Marcelo Tavares de, Trombini Nelson, Martins Francisco Carlos, Barbosa Sônia Maria de Almeida Pacheco. Treatment of nounion in the third distal of the radio. Acta ortop. bras. 2005;13(2): 95-99. 17. De Baere T, Lecouvet F, Barbier O. Breakage of a volar locking plate after delayed union of a distal radius fracture. Acta Orthop Belg. 2007 Dec;73(6):785-90. 18. Villamor A, Rios-Luna A, Villanueva-Martínez M, Fahandezh-Saddi H. Nonunion of distal radius fracture and distal radioulnar joint injury: a modified Sauvé-Kapandji procedure with a cubitus proradius transposition as autograft. Arch Orthop Trauma Surg. 2008 Dec;128(12):1407-11. 19. Cao J, Ozer K. Failure of volar locking plate fixation of an extraarticular distal radius fracture: A case report. Patient Saf Surg. 2010 Nov 25;4(1):19. 22. Rappo TB, Kanawati AJ. Non-Union Of Fractured Distal Radius Treated With A Volar Locking Plate: A Case Report. The Internet Journal of Orthopedic Surgery. 2012 Volume 19 Number 2. Trauma International - Special Subscription Offer. 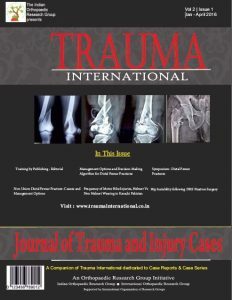 Dear Colleagues, in an attempt to expand the outreach of knowledge, we are now starting a special subscription offer for Trauma International Journal. Get the best in Trauma Literature at 2000 INR per year. Easy and secure online payment and book delivered at your doorsteps. Special offer for the month of September.